Why a red card from the Italian government against France about Africa? The European Union had instructed Germany to find solutions to the Greek situation. In a word, Germany was responsible for protecting these banks and was supported by France, which protected these banks in return. The ECB's financing to rescue Greece went directly to pay the creditors of Greece, France, and Germany. The European Union and the International Monetary Fund had taken drastic measures, throwing families into the streets. These structural adjustment measures are taken only to protect the banks of these two countries at the expense of the Greek people. The case of the Ivory Coast: the governments of the former president Houphouet were super advised by France on all the economic, political and military plans. The economic crisis known in the 80s that put the government of President Houphouet on their knees so that Cote d'Ivoire could not get up was advised by these French experts. The Ivorian State paid enormous sums to these great economic advisers of the Republic and was consulted on all levels. How could they not have foreseen or anticipated such a crisis and avoid the catastrophe? Was this a plot? And by who? Ivory Coast was strangled financially, everything was paralyzed. The state could no longer pay its employees. Germany was paying Ivorian bills and running the Ivory Coast government but France refused to do so. It was then imposed that Côte d'Ivoire must have a Prime Minister before it defends Côte d'Ivoire with other institutions and governments. The Ivorian presidential election of 2010 caused the Italian coast to be flooded by the people fleeing the war, killings, and massacres. After the presidential election the outgoing President asked to recount votes. France under President Sarkozy and some African countries, especially French speaking, 90% supported the dictatorship of President Sarkozy. The saddest decision of Mr. Sarkozy was the orders for drugs and hospital equipment paid but not delivered before the outbreak of war, had still not been delivered. Mr. Sarkozy had used the tactical deadlines and finally refused to deliver these drugs and hospital equipment to the State of Côte d'Ivoire. Those patients were told by Ivorian doctors that soon orders will arrive and we can take care of you and you will go home. How many sick in the North South East and West died from the refusal to deliver drugs and hospital equipment? Could these patients who would only like to live be held hostage because Mr. Sarkozy wanted to use blackmail and caused deaths because President Gbagbo did not want to leave power. How many had died during this refusal of France? During the Ivorian conflict France had cut off access to the international financial market to the State of Côte d'Ivoire even the Ivorian own funds deposited in the external banks of Côte d'Ivoire. The French government, proud to repeat to whom it is entitled the FCFA is a currency of Africans but during this conflict the French government has recognized the paternity of the FCFA by giving instructions to the governor of the Central Banks of Africa, West and Central Africa not to deal with the Ivorian state. The former Ivorian government has accepted the reality that the only way to circumvent the Machiavellian plan of the French government was to create its own currency and it was to be put into circulation in the month of April 2011. The French bombings began to rain on the Ivory Coast with more mercenaries being recruited in other countries to end the Ivorian state that the French government thought was recalcitrant. The new Ivorian currency would not see the light of day in April 2011, according to former Finance Minister Kone Katsinan. This question may not make sense, but an economic newspaper "The Economic News of Germany" mentioned it. A few years ago, the former French President Jacques Chirac said it publicly about the financing of France by Africa. French public and private newspapers commented that Monsieur Chirac is ill, his illness makes him lose his mind. The French government and the media of the French Republic were seeking by all means that this truth should not be repeated. The German economic newspaper "The Economic News of Germany" has published that France collects every year 440 billion Euros from 14 Francophone countries. That's about $ 550 billion. If this information is true, the French debt represents about 2,200 billion Euros, the fund collects countries of the Francophone represents a trifle of 440 billion per year. Only in five years the money taken by France could pay the French debt around 2,200 billion Euros? In which fund are these 440 billion Euros deposited? Why is the majority of French suffering? They are in the streets of France shouting their precariousness as national mourning. Why are these funds not going into the coffers of the state that holds the control? France is a technological country. It has knowledge that it asserts on the markets as to which ones are successful so there is income in addition to 440 billion Euros per year. If this information is true, it is a scandal, a crime of blood, racket etc. Francophone Africa can never develop by leaving large sums from its territory which is lacking everything. Hospitals and health centers are burial places; only 20% to 30% of Africans have access to drinking water, and school. University centers to train future country managers have become dumps. The populations of the countries from which they transfer 440 billion Euros live in extreme poverty. Having a house in Europe is not a crime but a misappropriation of public money is a crime. When government officials behave in this way, they become a target of foreign agents who lobby to cooperate and are influenced by the outside world. The French government, through its media, says the misappropriated funds come from their helpers who should go to relieve the people of suffering and corruption. We can say its comedy and hypocrisy. Collect 440 billion Euros a year from 14 countries for free, because this racket was done in non transparency, only a handful of individuals are aware. One humiliates an entire people by giving them a fraction of 0.00005% interest earned on the amount taken to African countries. This aid depends on the choice of the donor country, the benefits of future contracts. This management shames the French government created "Bad Things Acquired" for recalcitrant countries in Africa to punish them, to humiliate them. Badly Acquired Goods could be a good thing, but the management of the French government in Africa what can we call it? Have you ever heard of "Bad Things" from Arabs, Chinese, Indians, Pakistanis, Singaporeans, etc.? These leaders love their people, and they work for their people. Their hospitals and health centers are not death camps but to give life to their peoples. It is in Africa that we are waiting for help from the European Union or France so that their governments, in turn, will pay for basic needs. One wonders why they are Presidents, Ministers, and Deputies opposition leaders. If these people go to hospitals in their countries, their women go shopping in their countries and their children attend schools or universities in their countries, we think that Africa will wake up like a Titan. What is happening in Venezuela, Africa must have eyes open? This passage in force of the new president of the Venezuelan assembly Mr. Guaido who proclaimed himself president of his country. Ignoring the laws of his country and recognized by almost all European countries, Canada and the US because of huge deposits of oil and gold. The state of Venezuela has gold bonds of 1.2 billion deposited in England, the state decided to sell this bond to have cash but the US and the West refused. The bond belongs to the state of Venezuela. It was the same thing France used against President Gbagbo's Cote d'Ivoire in 2011. Africans must trust in themselves for the development of the continent. China's world's leading economic power, but in 15 years India will surpass China. What will be Africa's place? 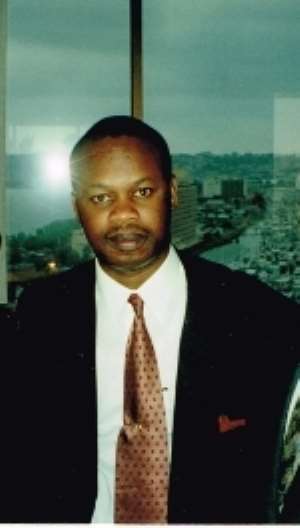 Dr. Amouzou received his Master in Business, from the European Advanced Institute of Management, has Certificate in Finance and Investment in Paris, France. He completed His work Post Graduation in Political Strategy, International Relations, and Defense Strategies and earned His Ph.D. in International Finance. Raymond Bernhard West; Fundacion Paraiso Sin Fronteras; Mr. Leroy Bryant Mr. Paul Kokou Amouzou; Mr. Morgan Lewis, Amouzou Nkrumah Production, Nouho Kamara, Mr. Leroy Bryant, Mazarin & Vassiriki Traore .